18 days to explore the incredible equatorial country of Ecuador! Discover national parks, volcanoes, mountain ranges and crater lakes, as well as meeting the locals in the towns, markets and during a worthwhile commnuity project. Discover the world's longest mountain range on a superb 16-day expedition to Ecuador. Take on the Andes, meet local communties, and explore the surrounding landscapes, with volcanos, crater lakes and national parks. Venture up into the High Atlas Mountains and through Berber homelands for your Gold DofE Qualifying Expedition. Then it’s back to Marrakech to experience the sights and sounds of the souks! An exhilarating and challenging 8-day expedition in Morocco, culminating in an exciting ascent of North Africa's highest mountain! Take geography outside the classroom on this incredible expedition to the the High Atlas mountains and the Saharan desert. 8 amazing days visiting Berber communties, film studios, spectacular velleys and trekking with camels in the desert. 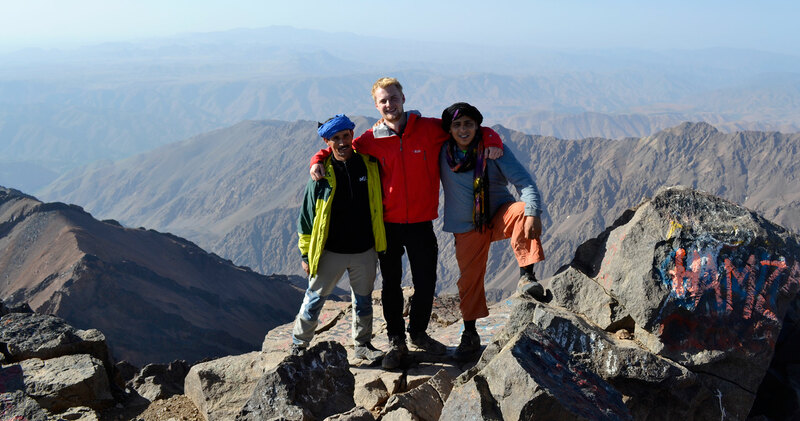 Basing ourselves in the breathtaking Atlas Mountains, we experience a community activity in a Berber village before undertaking a wonderful trek through Berber homelands, culminating in an exciting ascent of North Africa's highest peak! Discover the Atlas Mounatins and its welcoming Berber communtities on this exciting expedition to Morocco. Challenge yourself with trekking, meet local communties and learn about local culture, and explore the bustling cities and beautiful coastline, all in 12 days! The ultimate Moroccan adventure! Discover the bustling streets of Marrakech and the breathtaking views of the Atlas mountains on this incedible 14-day expedition. Get to know the local community, enjoy the views whilst trekking, and challenge yourself with an ascent of North Africa's highest mountain! An unforgettable two weeks in the Pearl of Africa, exploring national parks, meeting local communties and spotting some of the world's most spectacular wildlife. An unforgettable 11 days on the incredible Atlantic island of Madeira. Trek the varied volcanic lanscapes to the highest point on the island, explore the underground lava tunnels, traverse the coastline by mountain bike, and spot whales and dolphin at sea on this action-packed adventure! Acheive your Gold DofE Award on the Atlantic Island of Madeira! Trek and camp through fascinating volcanic landscapes, traverse the coastline on mountain bikes, and spot whales and dolphins at sea! Spend 7 days in the beautiful Hardangervidda region of Norway, enjoying exciting team-building activities with your friends includug traditional Norwegian games and orienteering, before completing an exhilarating hut-to-hut trek and finishing with a Norwegian fishing experience- a true adventure in the wilderness! Undertake your Gold DofE Qualifying Expedition through Norway's rolling hilly moorland and wild camp amongst the breathtaking surroundings. A really exhilarating challenge in Norway’s pristine wilderness! Winter wonderland for the budding adventurer! An incredible winter mountaineering experience on Nordic skis in the Hardangervidda Mountains. Trek the Himalayas on this challenging 17-day expedition to India's Ladakh region. Experience trekking and white water rafting in the stunning Markha Valley, before a visit to a Wonder of the World! Explore the world’s largest rainforest and longest mountain range, and discover volcanoes, cloud forests, and crater lakes. Stay with an Amazonian community and learn about local life, challenge yourself with exhilarating treks, and marvel at Ecuador's natural beauty on this 18-day adventure! Discover the jungle-clad gem of Malaysian Borneo on this thrilling 2-week adventure. This wonderful and life-changing expedition takes us into the beautiful Vietnamese countryside to interact with local communities, learn about new cultures, and explore the country’s varied landscapes with a challenging trek. On top of all this, we experience biking through villages, a traditional Sampan boat cruise and a visit to the fascinating Cuc Phuong National Park before discovering the exotic city of Hanoi. A life-changing and action-packed adventure in beautiful Vietnam, learning about fascinating local culture, exploring incredible laundscapes and helping local communities in need. An action-packed and wide-ranging Bolivian adventure with trekking, community and cultural activities, exploring vast mountain ranges and beautiful plateaus, salt lakes and deserts. The ultimate adventure in this treasure trove of nature and wildlife takes us on a action-packed 22-day journey through Sri Lanka’s many landscapes, with amazing opportunities for trekking, safari, community interaction and wildlife conservation, plus exhilarating activities such as white water rafting! Perfect for anyone seeking out adventure, trekking or an exciting chance for field study. An action-packed adventure on the Atlantic island of Madeira! Explore this volcanic archepalego when orienteering, trekking, mountain biking and stand-up paddle-boarding, plus visit the underground lava caves, and look out for whales and dolphins at sea! An incredible 20-day journey exploring this fascinating South East Asian country. We take the train to Mandalay and then cruise the River Irrawaddy to the splendour of Bagan. We then trek through rural Pao villages, staying overnight in Buddhist monastries. Next on to Inle Lake with its famed one-legged oarsmen and floating market gardens, before undertaking a worthwhile community project in a rural school. A truly magical adventure! Beginning in the foothills of the Himalaya, we bike through lush green countryside through a gorge on the Hindustan Tibet Highway before entering the arid desert mountain, Spiti Valley. We cross several high passes ranging between 4100m to 5300m. A serious challenge. 18 incredible days exploring the Himalayas on the mountain biking adventure of a lifetime! Travel to the stunning Himalayan region of Leh, where we’ll begin our exhilarating adventure! Using top-quality mountain bikes, journey through the Himalayan mountains, through incredible landscapes and on some of the world’s most exciting mountain bike trails. An expedition of epic proportions! 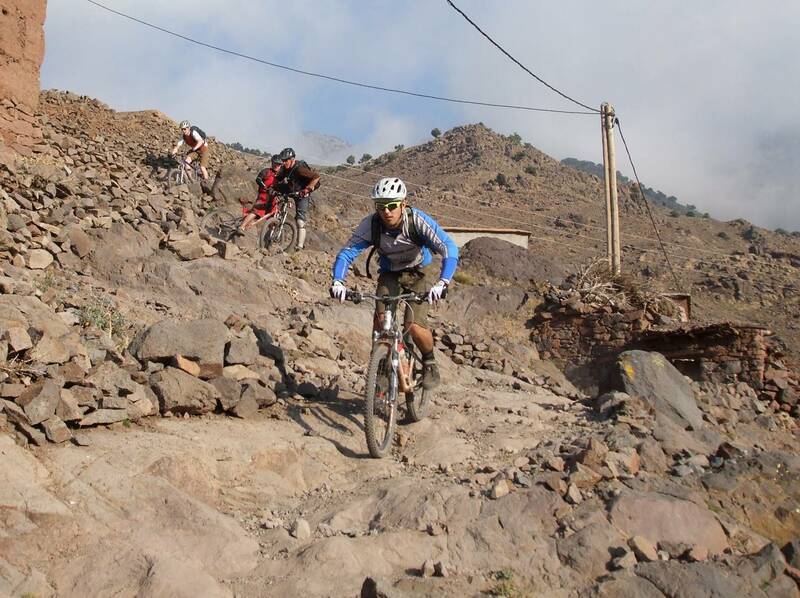 An incredible 8 day adventure, biking through the stunning landscapes of the Atlas Mountains! This journey of a lifetime follows off - road trails through dramatic Moroccan scenery, long beautiful valleys, past friendly Berber villages and sleeping in cozy mountain gites- a breathtaking bike journey. 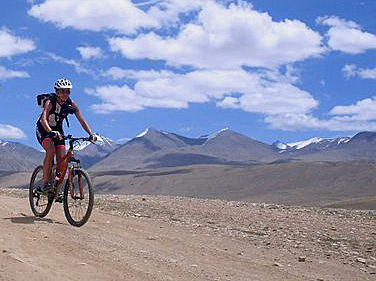 15 incredible days exploring the Himalayas on the mountain biking adventure of a lifetime! Travel to Pokhara and fly to Jomsom to begin this epic adventure! Using top-quality mountain bikes, journey through the Annapurna mountain range and the district of Mustang and on to Kathmandu, passing through rural Nepali villages and past 8000m peaks! We finish our epic journey in the vibrant capital of Kathmandu, with plenty of opportunities to explore Nepal’s fascinating culture as well as its beautiful landscapes. An exhilarating 12-day expedition to Morocco! We base ourselves in the beautiful High Atlas Mountains where we will spend time with the local community in a Berber village and will complete a hands-on, worthwhile, community project, before heading off into the mountains for an exciting trek, culminating in an ascent of Mt. M’Goun (4,068m)! A fantastic 12 day expedition to explore the incredible jungle-clad land of Borneo. This educational adventure starts in the city of Kota Kinabalu before visiting the orang-utans at Sepilok Sanctuary. The team then experience nature as they cruises down the mighty Kinabatangan River looking for proboscis monkeys and elephants. We will interact with a local community in the Corridor of Life – an initiative to preserve the ancient jungle and its unique wildlife. The team will attempt to summit the magnificent Mt Kinabalu at 4095m, no easy feat! An exhilarating 8-day expedition to 3 spectacular islands at the heart of the Azores Archipelago. Pico, before flying back to Sãn Miguel to complete our island adventure! Explore Morocco in winter and challenge yourself to a snowy ascent of North Africa's highest mountain! Learn winter skills and trek to heights of over 4,000m, before discovering the sights and sounds of vibrant Marrakech. An exciting and challenging 8 day winter mountaineering expedition to summit the highest peak in North Africa! Taking in the best that the Swiss Alps has to offer, spend 7 days in the Saas Grund, training in winter mountaineering before taking on the challenge offered by glacier trekking, Via Feratta climbing and a winter summit at over 4000m! An exhilarating 11 day expedition to explore Montenegro! We start on the magnificent Bay of Kotor on the Adriatic coastline before journeying to the beautiful and wild Kučke Mountains to trek amongst its rugged peaks, mountain forests and secluded lakes, whilst camping in stunning locations. It’s then time to experience white water rafting along one of Europe’s most spectacular river canyons before trying our hand at Paddle Boarding!